← FOR SEEKER …. thank you for your support! 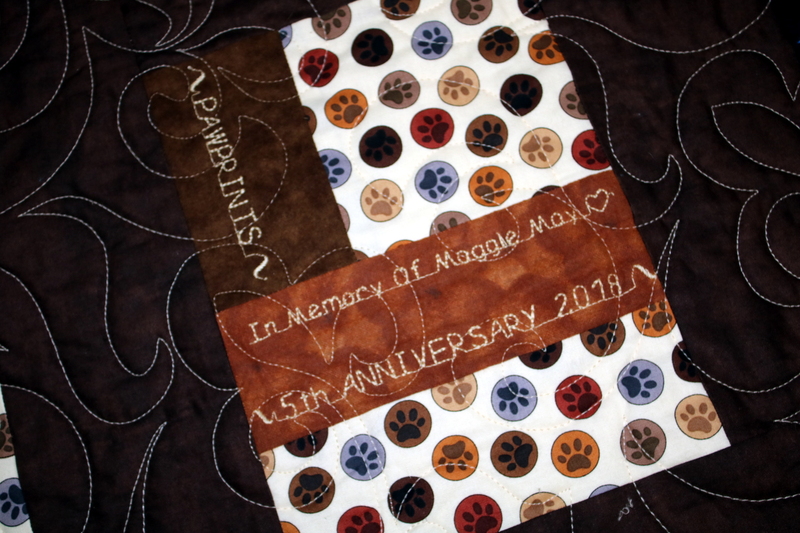 2018 5th ANNIVERSARY QUILT “PAWPRINTS” … REVEALED and YOU can win it! We love how our Anniversary Quilt turned out this year (as we do every year) and very excited to reveal our creation, our 5th! As hard as it is to let it go, we will once again raffle off our gorgeous piece on our anniversary, October 11th, the anniversary of Maggie’s crossing over the rainbow bridge, with all proceeds going to the Maggie May Fund. It’s always our favourite fundraiser and we want to beat our best of $603 raised! 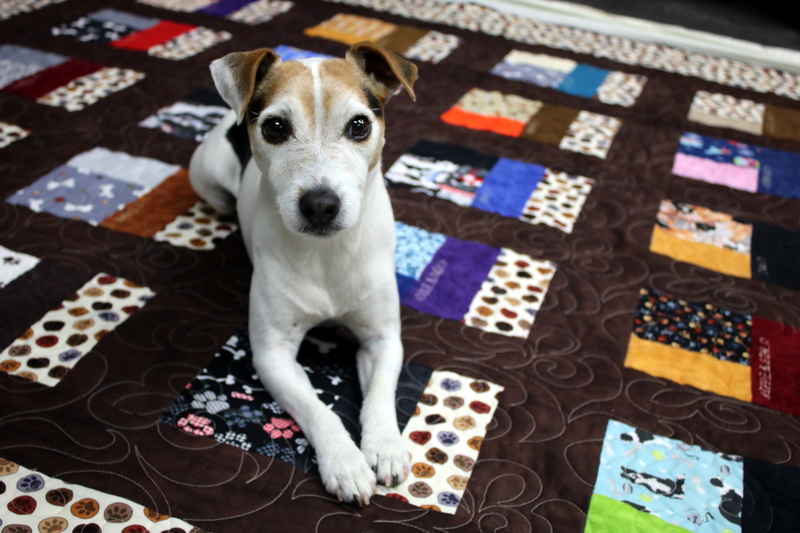 This year’s quilt is dedicated to the furry friends we have lost this year …. Gavin, Elsa, Sawyer, Cooper & HRH Finnegan. May you be at peace and know you are forever loved. Our quilt includes the fabrics and names from our personalized blanket orders between May 1, 2017 to April 30, 2018. Club). We have 28 names this year : Fender, HRH Finnegan (HRH Blanket Club), Piper, Ru & Richochet, Fixx, Ripple & Star, Jinx, Athena, Jackie & Louie, Nova, Rosie & Nia, Max, Ranier, Fysti, Elsa, Na’vi, Kira, Sawyer, Tucker, Takoda, Cooper, Bandit, Pawsh & Raine. Click HERE for more details and how you can WIN IT! 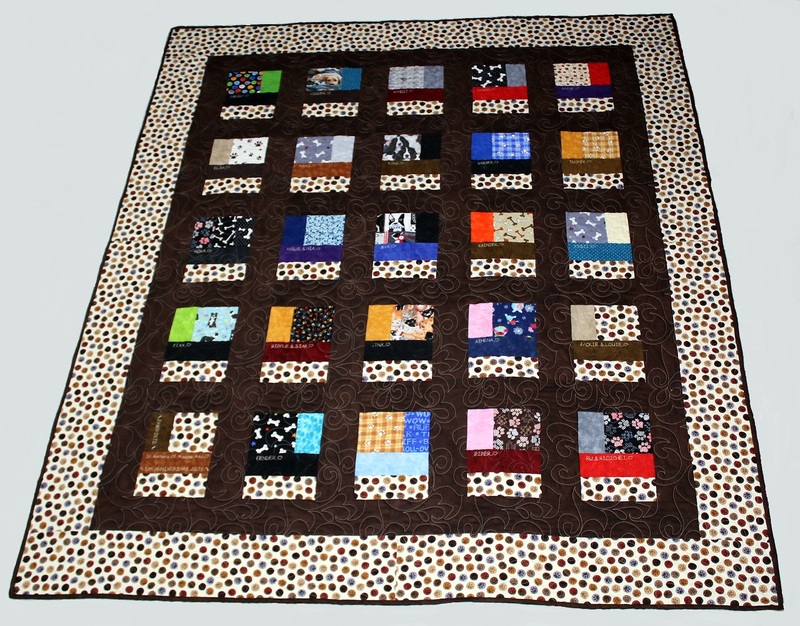 Click HERE to see our previous anniversary quilts! This entry was posted in Blankets & Bandanas, Fundraisers. Bookmark the permalink.